Varaa nyt, ennen kuin on liian myöhäistä! 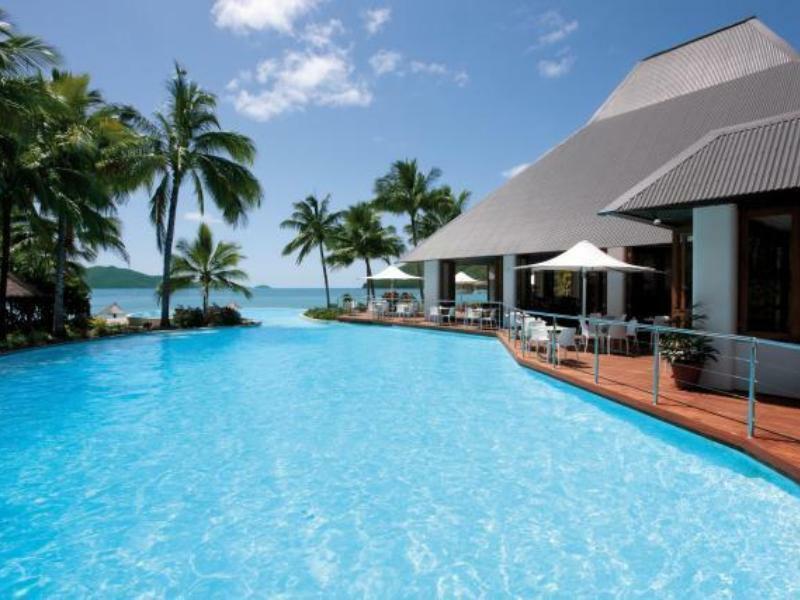 Onko sinulla kysymys kohteelle Hamilton Island Reef View Hotel? Matkailijoille, jotka ovat kiinnostuneita nähtävyyksistä ja kaupungin vilinästä kohteessa Whitsunday Islands, Hamilton Island Reef View Hotel on täydellinen valinta. Tämä hotelli on 10. Km päässä keskustasta ja tarjoaa pääsyn kaupungin tärkeisiin kohteisiin. 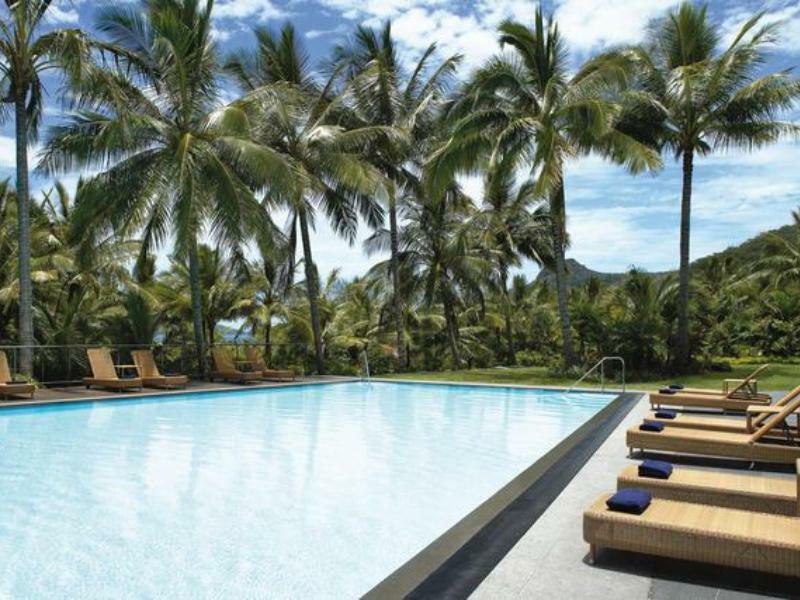 Hotellista on merkittävän helppo pääsy kaupungin lukemattomille nähtävyyksille, kuten Hamilton Island, Renegade kalastusalukset, Great Barrier Reef -lentokenttä. Tilat ja palvelut hotellissa Hamilton Island Reef View Hotel takaavat vieraille miellyttävän matkan. Yöpyessään tässä upeassa hotellissa asiakkaat voivat nauttia mukavuuksista, kuten 24h huonepalvelu, ilmainen WiFi joka huoneessa, liikuntaesteisten palvelut , WiFi yleisissä tiloissa, pysäköintitila. Kaikki hotellin majoitustilat sisältävät valikoituja mukavuuksia, jotka takaavat ainutlaatuisen yöpymisen. Voit nauttia rentouttavasta tunnelmasta koko päivän näiden palvelujen avulla kuntosali, sauna, golf-rata (hotellin yhteydessä), uima-allas, kylpylä. 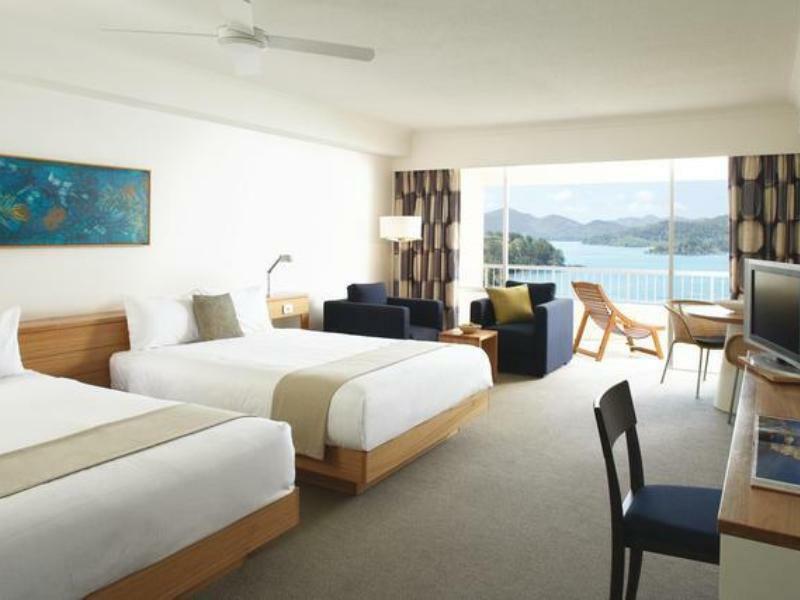 Hamilton Island Reef View Hotel hotellin ihanteellinen sijainti ja hienot tilat tekevät matkastasi täydellisen. The hotel shuttle service is good. Staff are friendly and helpful. Good location as Hamilton island is not large. The hotel price is quite overpriced for its quality and service. Free green/blue shuttle bus around Hamilton island. It is just in front of hotel, it’s very convenient. Happy stay for overall. Hotel was great to stay in, room was huge but the amenities were not there, you had to request them which i did not like. otherwise, the stay was great and i would stay there again for the discounted price. I had planned to travel to Heart Reef and Whitehaven Beach, so I chose to live on Hamilton island. However, I encountered very bad weather during my stay, so all the trips were cancelled and I had to stay in the hotel. The bad weather is not the hotel's fault, but satisfaction would be higher if he offered more alternative activities. We booked the hotel via Agoda.com. However when we checked in at the Reef View Hotel, I was told by the hotel staff that the room I booked with Agoda.com was different to what shown on the hotel system. The hotel manager was really nice and upgraded us to the sweet suite on the top floor including breakfast for us. He said he will take care of the additional payment with Agoda.com and told us not to worry about it. The hotel provided everything we need during our stay. The wifi was super fast. The breakfast was really good that I look forward to every morning. The room consists of two levels with living room, toilet, balcony and kitchenette on the bottom floor, and king sized bed, massive bathroom with spa and balcony on the top floor. I would definitely go back to this hotel again. The room is super large and even I booked a Garden view room which is located in the 1st floor but still having very good ocean view. The bath room has tub+shower and also very generous space. Very delicious breakfast was serviced across the staying. Location is also very convenient to be accessed by walk to everywhere in the island, and buggy is also another option for those tourists who don’t want to walk a lot. High recommended. Words is not enough to express the beautiful experience I had in Hamiton Island. Plus the hotel is exactly what I wanted for my so called short break away from Sydney. You would not believe that you are still in Australia because the place is soooo beautiful. I am so satisfied and worth the price of what you've paid. Merely just the scenery from the balcony is more than enough. Priceless!!!! I wish I have more time. But surely will come back and stay in the same hotel. Loved the location of this hotel. The staff are welcoming and accommodating and the rooms are very clean. The only thing I can fault is that breakfast isn't included automatically. I think it should be considering the amount you pay per night! Huge rooms, huge bathrooms and fantastic views from the balcony. The Hamilton Island app II’s good. Staff nit always aware of what is included with each package ( eg the Sunday yoga which they tried to charge us for). Ex aware that building works and the kitchen at the back of the hotel do detract from the island idyll. We paid almost 400 per night. The room was great but I would expect a few more extra touches in the room. As part of my holiday we also stayed in airlie beach for 160 a night and got a whole apartment with the same view over looking the whitsundays. The rooms were very comfortable but 400 a night i would expect something extra special about the room. We paid alot to fly and travel to the island. The contenental breakfast was great but think it should be included in the room price. My booking at the whitsundays accidently got lost through a booking website. So I had to secure a room here since the other one got lost by the other hotel on the island. The rooms is dated, but who cares when you have a multimillion dollar view. The resort has 3 big outdoor pool with amazing view. We will definitely go back. NICE VIEW FROM THE HOTEL, CLOSE TO EVERYWHERE AND LOVE TO COME BACK AGAIN!!! We stayed at the Reef View in one of their Suites as it was a special time for us to spend with each other. The Island and facilities were excellent and the staff assisted me with something special for my wife and really delivered. Staff were friendly and accommodating and I would highly recommend The hotel and island as a destination for both families and couples. Great Location & Awesome views of Cats Eye Bay, however where this hotel lacks.. it is in desperate need of a massive refurbishment as its over priced & felt like I was paying 5 Star prices for a 3 Star quality hotel. The best features of the hotel are facilities free Wi-Fi in all rooms, the fitness center, the recreation centre, the restaurants & free water sports amenities. The most annoying thing about the hotel is the noisy trolleys on each floor very early in the morning going up & down outside your door forget a nice quite sleep in.. The male hotel reception staff however we also very ordinary & disinterested in being accommodating but the other staff around the hotel were great especially the water sports team & specifically Ben he was very helpful, a very switched on guy and very knowledgeable about the facilities & the island including restaurants etc. Great Work Ben.. Keep it Up.. The hotel stay was awesome but the price to pay was on the high side. When I was there it rained the entire time and there was nothing to do in the hotel nor on the island. It was a disappointing trip. The hotel could provide more activities for wet weather. To conclude, do not visit Hamilton island in April! Nonetheless, the hotel was comfortable and the swimming pool was great. Loved our time at Reef View. Perfect spot for anyone who loves a tropical getaway... Our room, on 18th floor, had the most stunning views! Free buses, easy walk to everywhere, buggy if you want to get there faster, pools aplenty, good restaurants, beautiful clear water 200m from the door..... We will be back! We had an awesome time, the hotel provided everything you needed, plenty of towels for pool & shower, great, friendly service everywhere throughout the hotel, great pool & restaurant. Old school hotel, which was great, big rooms & not too many rules ! great staff ! great place! The hotel and indeed the whole resort is well staffed and friendly. As we love to walk and explore we found it very convenient to the scenic and well marked bush walks. It is close to the village and marina, coffee shops, restaurants etc. We enjoyed a very relaxing and enjoyable few days away from the rat race. Our stay was excellent. Great Balcony with fantastic view. Comfortable walking distance to great restaurants, shops and tour departure points. Included breakfast was great. Inluded non-motorised water sports were awesome (but can only be utilised on high tide). Nearby picuresque pools to laze around very relaxing. The rooms were huge and well appointed, the swimming pool was heated, and the included breakfasts were fantastic. We loved our stay at the Reef View, the room size was perfect for a week away with our 2yo, enough room for her to move around. The heated pool was ideal for the August temperatures, where the resort pools were a little cool. The only thing that let this hotel down was the service we experienced the one night we ate in the Pool Terrace restaurant. We ate breakfast there almost everyday which was fantastic, so were disappointed when dinner didn't live up to the same standard. We booked for 5:30pm and it was nearly 2 hours by the time we left, from main course and dessert. The dessert was very slow coming and our waitress had to chase it up twice. Our Hamilton Island escape was a present for my husbands birthday and should have been a superb experience as "Hamilton Island" was in my eyes classed as one of THE highlights of Australias East Coast. Living on the Gold Coast and been to Noosa for a few days beforehand we were quite disappointed to what we expected. Although the hotel/room was run down (for what I had expected for the price) the view of the hotel was amazing though and the room was large with 2 queen size beds. The service was fine, but I was a little upset when they wanted to do the room at 8.30am and we said that we are out of the room in 5 minutes. Coming back 4 hours later the room still wasn't done and they came around at about 4 or so again when we wanted to stay in the room. So we left it till the next day, but the same thing happended again. Also being on an island you are unfortunately restricted with restaurant options and (convenience) stores which made the choice quite hard and expensive as well. Chosen the Reef View Hotel Main restaurant for dinner I asked to change the $39 steak with fries to vegetables, which they wouldn't do for me as "the chef is too busy at the moment" and could just offer me to buy vegetables in additon to the meal. So we left the place unhappy......Having said that I want to mention that I am normally not a person that likes to complain a lot, but just coming from Noosa where we had such an opposite experience, we were disappointed of the whole island. Also 3 days in a row we tried to get on the free orange shuttle bus that takes you around the island for about 40 minutes, it was always full (the purple bus was out of action and there was just 1 orange bus going around all day). Hamilton Island is in my opinion overrated, overprized and very touristy......but with amazing views!